Which David Do You Choose? I don't use the phrase "Which David are you voting for?" since I am not able to vote one of them (I have to admit that I am Indonesian but I was officially hate Indonesian Idol since season 3). 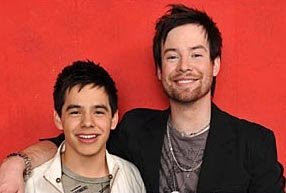 As the show goes on, for many reasons, I want David Cook to win, because David Archuleta gave me heartache when he's singing. But I just watched the finale round show minutes ago on StarWorld and oh-my-God both Davids did great! And Cute Little Baby Teddy Bear Archuleta, oh God, he was amazing on round 1. No more heartache! Completely breathtaking. But still, I hope David Cook wins!! I mean, he's awesome and always did excellent job with all songs he sang. Archuleta was monotone, but okay, he did much better in the finale round, and a bit better than Cook today. The thing is, which David? yesssh... cookie all the way! aku david cook! dan dia yang menang! ihiyyy. Aq gak peduli dikatain sk sm brondong, khan Archuleta bagus juga suara & performancenya. Aq sih gak ada masalah sama kemonotonan & keballad-annya dy, soalnya aq emang suka sama ballad (& Archuleta!). Yg penting dy tallented banget!!!!! Wah Nova, temenku juga ada yang suka Archuleta. Ngga papa lah ngga jadi American Idol, tapi kan karier dia akan terus berlanjut..
David Cook, bcos he's brilliant. He can take any kind of song and make into a rock song which is really good. And he won, yeeeay!